Key Difference: Mother’s milk offers the appropriate amounts of carbohydrate, protein, and fat, breast milk provides vitamins, minerals, digestive enzymes, and hormones required for an infant. Cow’s milk has high amounts of calcium that is essential for development and strengthening of bones. It also has a number of other nutrients and vitamins (either naturally or through fortification) including Biotin, Iodine, Magnesium, Pantothenic acid, Vitamin A, Vitamin E, etc. A new mothers has many questions when it comes to feeding her baby – how should she breastfeed her baby, how many months should the baby be only on breast milk, should be continue breast milk after 6 months, when is the right age to ween the child from breast milk, which is more beneficial to the baby, goat milk or breast milk and so on. These questions are common and are often the worry of mothers worldwide. Breast milk and cow’s milk are completely different from each other, in terms of benefits and composition. The difference composition of the human milk is what makes it so beneficial for the baby. When it comes to deciding the best milk for an infant, it is a no-brainer – breast milk is the best. Mother’s milk is designed specifically in order to provide the infant with the needed minerals and nutrients needed for it to grow big and strong. Mother’s milk is the milk that is excreted by a female from her mammary glands in her breast. It is not exact and can alter itself in order to meet the mother’s needs. It is the universally prescribed for infants. It offers the appropriate amounts of carbohydrate, protein, and fat, breast milk provides vitamins, minerals, digestive enzymes, and hormones. Additionally, it is full of antibodies and lymphocytes that is essential for the baby when it comes to fighting infections. The amount of milk and the composition of milk differs from mother to mother and depends on the need of the infant. As the infant weans from the milk, the less milk the mother produces and vice versa. The composition of the milk also changes depending on the baby and the age. As the baby ages, certain nutrients such as iron is reduced. Additional solid foods are often introduced after the child reaches 6 months. It is often advised to breast feed till the child turns 1 and if required until the age of 2. After this, there is often no need to breast feed the child but the parent can continue to do so, if she wants. After the child grows older, they are often switched to cow’s milk. This milk is beneficial in its own terms. 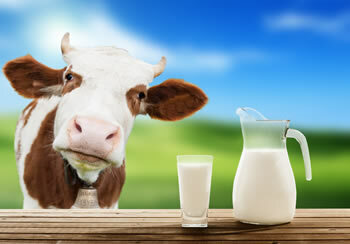 Cow’s milk has high amounts of calcium that is essential for development and strengthening of bones. Processed cow's milk was formulated to contain differing amounts of fat during the 1950s. One cup (250 ml) of 2%-fat cow's milk contains 285 mg of calcium, which represents 22% to 29% of the daily recommended intake (DRI) of calcium for an adult. Depending on its age, milk contains 8 grams of protein, and a number of other nutrients (either naturally or through fortification) including Biotin, Iodine, Magnesium, Pantothenic acid and many others. While a lot of people prefer low fat milk or 2% milk because of its lower fat content, many scientists are claiming that whole milk is far better as it has a better chance at satiating hunger. Further research on milk also suggests that consumption of milk is effective at promoting muscle growth and an acid that is found in milk may also help in reducing body fat. Milk has a lot of benefits and should be consumed on a regular basis. For people that are lactose intolerant, there are other forms of milk such as soy milk, almond milk, goat milk, etc. When it comes to giving milk to an infant, nothing is better than breast milk. It offers a lot of benefits and aids in the growth of the child. However, as the child grows and weans off breast milk it is often best to substitute breast milk for cow milk or any other milk in addition to solid foods. Decreased risk decreased risk of sudden infant death syndrome, increased intelligence, decreased likelihood of contracting middle ear infections, cold and flu resistance,a tiny decrease in the risk of childhood leukemia,lower risk of childhood onset diabetes, decreased risk of asthma and eczema, decreased dental problems, decreased risk of obesity later in life, and a decreased risk of developing psychological disorders.